Marinated and broiled flank steak is a versatile leftover. Rarely will I rewarm it and serve it in its original form; more likely, it will end up in pasta sauce, on pizza, or in tacos. 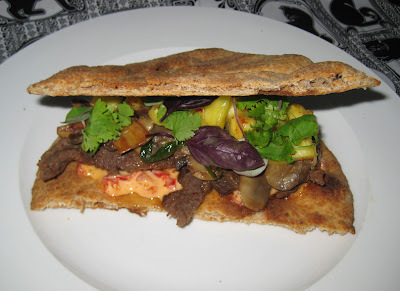 We had a small piece of steak left over from last week's Korean-esque sandwiches and I decided to use it in sandwiches once again, this time changing up the bread and other fillings. 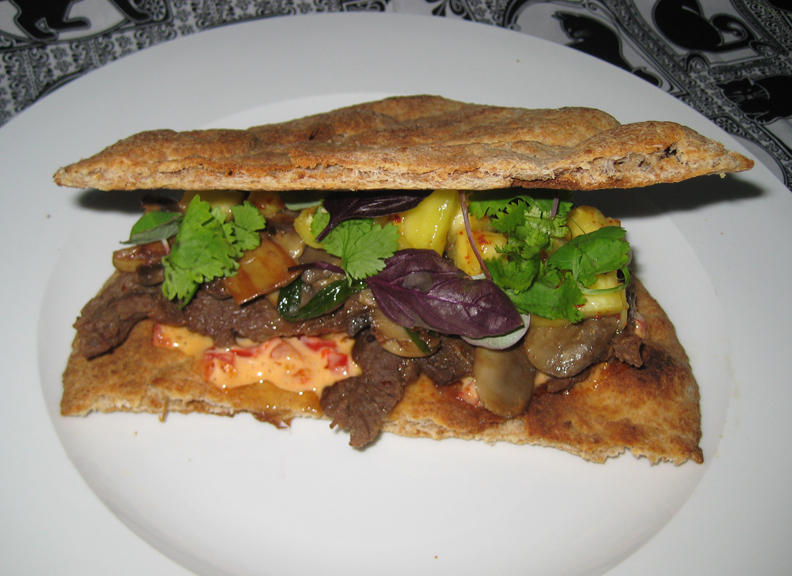 Lightly toasted flatbread formed the base, with sautéed mushrooms supporting the small bit of meat. A chopped pineapple relish, herb salad, and spicy mayonnaise added sweet and savory elements. To make mushrooms: heat a bit of olive oil in a saute pan and cook mushrooms and scallions until mushrooms release their juices and begin to brown, about 10 minutes. Salt to taste and set aside. To assemble sandwich: lightly toast flatbreads. Cut in half. Spread insides with mayo. Top with mushrooms, steak, relish, and herbs. Cover with other half of bread and eat like a sandwich. Alternately, you can put toppings on both halves and eat open-faced.